If you’ve been to the Phillips, you’ve likely encountered Jacob Lawrence’s epic Migration Series, a sequence of 60 paintings of which the Phillips owns 30 (the rest live at the Museum of Modern Art in New York). Since their acquisition in 1942, these works have played a critical role at the heart of the museum’s collection, inspiring vast educational resources, performances, exhibitions, and community programs. Visit the crowdfunding campaign to learn more. We’re excited to announce plans to launch a Jacob Lawrence Microsite next summer, but we need your help to make it happen! Visit our Indiegogo crowdfunding campaign through Dec. 10 to learn more about what the microsite will look like, the resources users will have access to, and where donations will go. This is a particularly critical moment as the launch of the microsite will coincide with the co-organized exhibition Jacob Lawrence: The Migration Series that will be presented at the Museum of Modern Art in New York in spring 2015 and then at the Phillips in fall 2016. 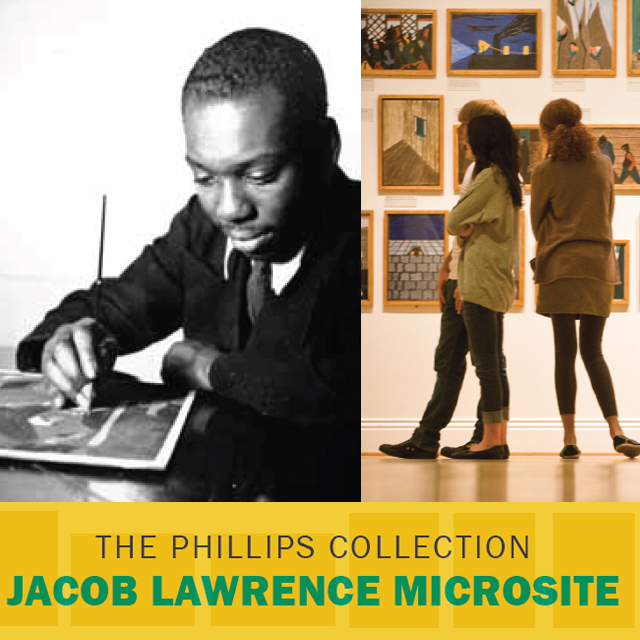 Along with the Phillips’s treasure trove of knowledge and insights about Jacob Lawrence amassed over the years, the site will feature never-before-published video interviews with the artist, high-resolution images of all 60 panels in the series, biographical materials, an interactive map, archival photographs, and audio and video clips of musical, literary, and historical events of the time. The interactive site will engage visitors with the powerful history and contemporary context of migration through the lens of Lawrence’s striking visual masterwork. Help us spread the word! Share the Jacob Lawrence Microsite Indiegogo campaign page with friends, family, and anyone you think might be interested using http://igg.me/at/jacob-lawrence. Watch #LawrenceLegacy for updates and progress!